14 Must-Have Super Bowl Gadgets For Your Game Day Collection 0 out of 5 based on 0 ratings. 0 user reviews. 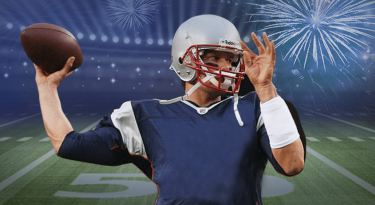 Make Super Bowl 50 truly memorable with these 14 gadgets. You’ll be the envy of all your friends! February 7th and the kickoff for Super Bowl 50 at Levi’s Stadium is less than a month away. 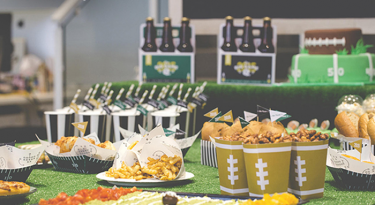 You’ve probably been watching excessive amounts of football, prepping for your Super Bowl party or planning where you’ll spend Super Bowl Sunday watching the game. But if you’re really looking to get into the hype this year, may we recommend that you get your hands on one (or a few?) of these must-have gadgets. Truly, your Super Bowl collection won’t be complete without them! Ok – this isn’t really an unusual gadget, but why not get a new TV just in time for the Big Game? If you can’t make it to Levi’s stadium on February 7, 2016 because you forgot to buy those Super Bowl 50 tickets in advance, don’t bum out about it! You can tune into the game and catch all the ads in high-def on one of LG’s new OLED TVs. Just think, your new TV will last far longer than the Super Bowl game, so if you’re going to shell out thousands of dollars, why not go for the TV rather than a seat at the stadium? Why get a new TV for the Super Bowl, but not get a new, football-shaped remote? If you really want to feel like you’re in the zone, this remote is a must-have! True, you probably won’t be switching channels come Super Bowl Sunday, but this cool accessory is enough to make your friends envious for sure. Whether you’re at a party or hosting one yourself, you’re bound to misplace that Bud Light team beer can in the crowd. With a Beer Pager, you can track that brewsky down just in time to catch your team’s touchdown! Ladies, this one’s for you! (Okay, maybe it’s more to please the dudes) Go from a size A cup to a double D in a matter of seconds with this WineRack Sports Bra! Take that bottle of wine or mixed drink wherever you go and look great while you’re at it! One of these babies will make the bros turn their heads and they’ll definitely be #UpForWhatever the second you step into the room! Gents, while you’re over there checking out the ladies, here’s a little something for you. Put on your game suit and a few extra pounds with this Beerbelly Stealth before you head into the Stadium and enjoy some beer on the go. It might be a bit of a turn off the ladies, but at least no one will ever know that you’re carrying some booze. Whether you hang it up on the wall, use it as a piece of art, or add it to your extreme workout session, (cuz you’re probably trying to get fit for the Big Game), you can’t go through the Super Bowl without at least having your own customized WeatherTech floor mat! After chugging down a few bottles of beer, and downing a few shots, you might just catch us singing along (out of tune) with Beyonce during her Super Bowl halftime performance. But if you really want to join Coldplay on the big stage (or at least provide some sort of entertainment to your guests), start off by belting to their tunes with a karaoke set in place. Sitting halfway across the room and really craving those crunchy nachos or Doritos? With this arm extender. you’ll be able to grab more than just chips from the other end of the table — you might be able to chuck a football halfway across the room and hit your bro right on the head. Now that’s fun! 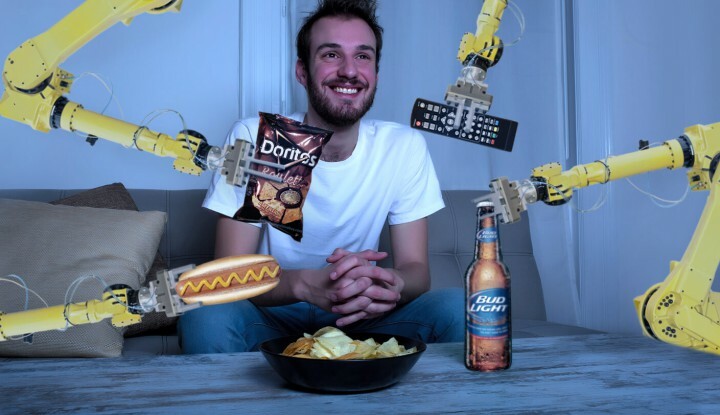 If you really want to get creative and have the ultimate Super Bowl experience, here’s one super cool gadget you have to get! Test your beer making skills with this kit and share the love with your friends! You’ve probably gotten tired from all that mixing and brewing, so if you want to take the lazy way with your beer serving, then this BeerTender is a no-brainer. Quick to serve, simple to use, and doesn’t make noise – this is every beer lover’s dream come true! We get it. You have no energy and are probably exhausted by the thought of doing all that Super Bowl gadget shopping. 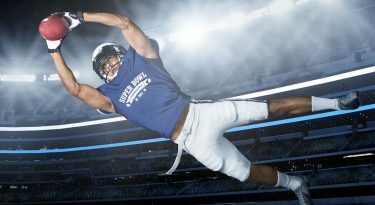 But if you think you’re a Super Bowl commercial know-it-all and are not planning on getting gadgets in light of the Big Game, then we challenge you to at least test your skills with this ultimate Super Bowl commercials quiz. No? Not feeling it at all? Well, then what does that say about your personality? Find out here.